Tigerwood Hardwood decks are trending among discriminating homeowners because they are gorgeous, durable and more affordable than you might realize. For less than the cost of a composite deck, your home can be outfitted with the stunning addition of a tigerwood deck that has a higher “wow” factor and will last longer. This tigerwood buying guide gives you comprehensive information you can use to compare this tropical hardwood material with your other favorites, whether ipe, composite, redwood, cedar or other popular type. We cover them all and more, making it easy to research decks in just one place. Deck prices, pros & cons and factors to consider with each material are presented. Let’s jump in! This beautiful wood is grown in sustainable and managed forests from southern Mexico south through Central America and South America. Tigerwood is also called Brazilian Koa and Goncalo Alves along with many regional names. It is a hardwood, so it has a durability unmatched by pine, even pressure treated southern pine. Aesthetically, the wood is an undulating blend of light orange to deep, ruddy red with streaks of brown to black. Like all woods, it is available in grades, with clear, knot-free wood being the most desirable and therefor most expensive. What makes Tigerwood (Latin: Astronium fraxinifolium) such a suitable deck material is its high resin content which, like the resin in cedar and redwood, makes it very resistant to moisture, rot and insect infestation. Tigerwood forests are quite sustainable, and the trees grow to usable size in 25 to 35 years. The specie isn’t endangered, and most countries where it grows control harvesting, so that the forests are not depleted. Like ipe, tigerwood is extremely hard (Janka rating: 1850), so it resists scratches, dents and chips. It is hard enough to use in furniture and both residential and commercial flooring. Tigerwood tropical hardwood does not require sealing or staining, though some contractors do recommend application of a sealer on a yearly basis that contains UV-inhibitors to help prevent the wood from fading. When not stained, tigerwood will gradually fade over the years. However, the process is slow, and the wood will resist splitting and cracking. Consider first the reddish color of Tigerwood hardwood. Will its tones look good with the siding you have on your home? It might clash, for example, with traditional red brick or stucco tones in the peach to red tones. However, tigerwood tropical hardwood looks fantastic with light and neutral-colored siding. If you’re concerned about the ecofriendliness of tigerwood, it is a better choice than pressure treated lumber because it isn’t saturated with chemicals. As a hardwood, tigerwood can be reclaimed and repurposed (a growing industry) when it’s past its prime as a deck material. When you shop for tigerwood decking, you can ask the retailer whether or not the wood has been harvested from managed forests. The retailer may be able to provide you with certification from the Forest Stewardship Council (FSC) or similar agency. As a hardwood, tigerwood decking installation goes slower than softwood installation. This is because most holes will need to be pre-drilled to prevent cracking the wood. This will add to the cost. Installation costs are shown below. There are tigerwood decking pros & cons to consider. Here are its benefits, many of which have been pointed out already. There are just a couple of potential drawbacks to tigerwood decks. How Much Does a Tigerwood Deck Cost? Let’s answer your tigerwood decking prices question. As with most hardwoods, tigerwood is available in good/better/best grades. The clearer the wood – meaning it is free of knots – the higher the price. Decking certified by the Forest Stewardship Council is slightly costlier. Finally, standard, pre-grooved and tongue & groove planks are available. These factors account for the price ranges in the tables below. Now, let’s convert these dimensions into square feet and come up with prices. The above tigerwood decking costs are just for the planks. We need to add in rails, spindles, posts, fascia, stairs and accessories to give you an idea of the cost of a finished deck. Decks near the ground might not need railings, so check your local community’s building codes. Deck repair goes more slowly than deck construction, so costs are higher. Here’s the cost for the material and the repairs. This is a low-maintenance deck material that will last 20 years with no maintenance. If you want to get 30+ years from it (perhaps 50! 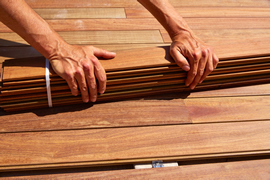 ), these tigerwood deck maintenance tips will help. 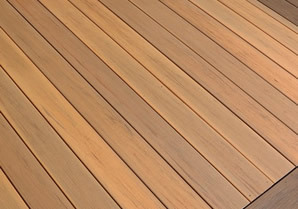 This tigerwood decking Q&A answers a few common questions. What decks cost less; what decks cost more? Pressure-treated wood and cedar cost less. Redwood and ipe are very similar in price. Aluminum will generally cost more, depending on what grade of materials used. The same is true with composite. Can tigerwood decks be built on a pressure-treated frame? It depends on the local climate. Tigerwood is more dimensionally stable than treated pine, so the expansion and contraction of the pine might cause issues with the fasteners pulling out. Check with your deck installer to see if this is possible. Of course, if the framing is going to show, as in an elevated deck, you’ll want to use tigerwood for the frame. I want a low-maintenance deck. Will tigerwood work? You don’t have to do anything to tigerwood, though not sealing or staining it will mean it will fade faster. An aluminum or composite deck would not need maintenance other than regular inspection, and there would be no negative consequences. If you’re going to invest in a gorgeous but expensive decking material like tigerwood, it makes sense to have the deck professionally installed. 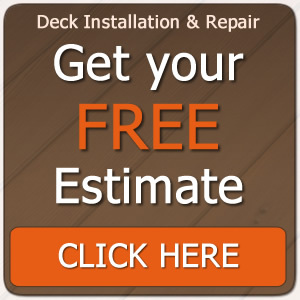 Proper installation enhances the looks and ensures that the deck is safe. . If you’re ready to get deck estimates for tigerwood or any other material, we can help you find a qualified deck builder. Our service is free, and there is no obligation. The deck professionals who use it are screened. You’ll receive competitive written deck estimates and have the chance to ask each deck contractor about their experience and qualifications. It’s the no-hassle way to get free estimates from some of the top deck builders in your local area.